I will post about our little Presidential stalking adventure tomorrow so check back for that on Thursday. 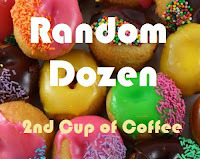 Today Linda at 2nd Cup of Coffee is hosting her weekly 'random dozen' meme and I'm playing along. If you want to join the party of randomness just answer this week's questions on your blog or in the comments section here. Leave a comment at Linda's too so everyone knows where to find your randomness. 1. Which is worse: a long, boring meeting or standing in a return/exchange line after Christmas? Definitely standing in line...I'm way better at something that involves sitting. 2. Except for maybe Rosie O'Donnell or Ann Coulter, nobody likes confrontation, yet we all have to deal with it. When you feel cornered and defensive, do you "bite back" or become passive aggressive? I dislike confrontation. I'm the third child in my family and we're the peacemakers aren't we? I suppose if I'm honest there could be a little passive aggressiveness in me when I'm pushed. Some...I've not researched it myself but others have...a little German but mostly Irish and English...I knew there was a reason I was so happy living in the UK. My dad enjoyed researching genealogy and one year for Christmas my sister put his collected notes into scrapbooks for us. One of my favorite things in the scrapbook is a mention of something that was found written about one of my great great greats...it said simply, "He was known as the most reasonable of men. He never lost his temper, but could stand for the right against any odds..." Isn't that a nice legacy? 4. What is the quickest way a person can endear him/herself to you? 5. Cake, pie, cookies, or ice cream? (Note there is no "all of the above" option. You must choose one. Feel free to elaborate on flavor or memories tied to this dessert.) If you'd like, you can share a recipe, but you certainly don't have to. German chocolate cake. This was what I always asked for on my birthday. I love anything chocolate and anything coconut. 6. Females: Do you regularly change your handbag to coordinate with your outfit? no...I carry neutral bags for the most part, change more by the season. I do have one fabulous orange bag that I love to carry but it doesn't quite go with everything. 7. Are you task-oriented or relationship-oriented? I'm all about my peeps. 8. IHOP, Bob Evans or Cracker Barrel? Silly question-it's Cracker Barrel of course. Nobody really likes IHOP better than Cracker Barrel do they??? 9. Have you ever left a movie in progress in a theater? Why? only once...I was about ten and had a sudden case of the stomach somethings...my whole family was there and no one was too happy with me. 10. What is one area of life in which you would like to develop more discipline or organization? discipline-excercise...but I am trying here. organization-my photos...there's a big box or ten just calling out my name begging to be organized. 11. Was middle school fun or painful? Frankly I think if everyone could just skip right on past grade 7 the world would be a better place. 8th grade though? Loved it! 12. What is your favorite Fall beverage? warm cider... I love the way it makes my house smell and love the taste too. All warm and autumny. I love the fall in general-the weather, the colors and the smells...oh, and college football of course. This too sounds like so much fun. We do share a lot of the same responses and looking forward to this fall when hot apple cider and caramel is coming. You are my kind of gal! We visited Canada and Maine this summer too! We did the other end of Nova Scotia. What a wonderful place. Hope to see you back, and as I've read a little here, I'll be back too! Blessings. LOL! I forgot chocolate might endear someone to me! Oooooooo... I do not care for Cracker Barrel. I'll eat there - but it will NEVER be my first choice! LOL! You have an ORANGE handbag??? Ohhhhhh I have JUST the outfit for that! I LOVE orange! Loved reading your answers. You and I are alike in so many ways. I LOVE some chocolate and my peeps are the joy of my life too! Once the weather starts turning cool, I drink hot cider all the time. I don't like coffee, so hot cider takes the place of coffee for me. I love the fall too. It's almost your birthday!!!! Raining here. Have a great evening. Love & blessings from NC! chocolate and coconut, yummy! I'm with ya there!